Juniper Mountain Electric happily serves the Denver Metro residential area. Our team of highly skilled professionals are always ready to help customers in need, whether for an urgent repair or rewiring. If you live in our service area and need electrical services, please call 720-660-1441 or schedule an appointment today. Our efficient and skilled professionals will cater to your every need. Lighting circuit installations, and more. New circuit installations can be extremely dangerous for people who are unfamiliar with electrical installations and repairs. By hiring a professional, you can ensure the installation is done safely. Juniper Mountain Electric will happily assist you with new circuit installations and deliver excellent results at an affordable price. Say goodbye to unnecessary extension cords by adding new electrical outlets. Our professionals at Juniper Mountain Electric can install outlets in any room you require, and we can answer your questions to make sure you are completely satisfied with your design. In order to keep your home safe, your electric panel needs to be up-to-date. To keep up with the electrical demands of your household, you may need to upgrade your existing electrical panel. 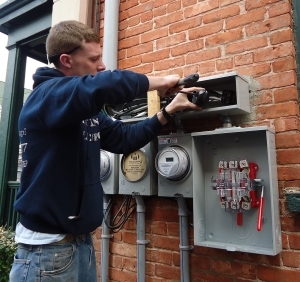 Juniper Mountain Electric can offer you a quick and efficient installation with excellent customer service. Many people love to decorate their homes during the Christmas season. However, it can be tricky with a shortage of outlets and switches. Be careful of how much you use or you could even overpower your existing electrical system. Enter the holidays safe and carefree by choosing Juniper Mountain Electric for your holiday light installations. Cooling down in the summer can be difficult, especially when you don’t have air conditioning. A new ceiling fan will help cool down even the hottest rooms of your home. At Juniper Mountain Electric, we will help to ensure your ceiling fans are installed properly. Basements are an underutilized space. Currently, many homeowners are now figuring out ways to best utilize their basement to its maximum potential. This can require electric finishes and installations. Juniper Mountain Electric can provide you with everything you need to ensure your electrical system is operating at its optimal functionality. Building a new home requires the need of a good electrician to take care of all your electrical service needs. Don’t take any risks, and go with a company you know you can trust. Juniper Mountain Electrics works hard to ensure all your needs and wishes are taken into account, and works with you to install an electrical system you can enjoy for years to come. The correct installation of data cabling is essential for both businesses and residential homes. Due to the technical nature of this job, it is better to be completed by a professional. Juniper Mountain Electrics can provide you with all your data wiring needs with installations completed correctly the first time around. When remodeling a room in your home, you may be considering additional outlets or rewiring your current electrical system. If so, call upon a team of experts to assist you. Juniper Mountain Electrics offers attractive rates for remodel assistance and will ensure all your electrical needs for your remodel function with the best of its ability. Are you tired of always waiting on the electrician? Sometimes even showing up days to late? Choose a company you can rely on in an emergency by choosing Juniper Mountain Electric. We are always ready for our customers and we will send a professional right away! Juniper Mountain Electric can install recessed lighting in your room to create an entirely new feel. Our team of experts will listen to your needs and wishes, and then offer possible ways to best achieve your goal. To properly install recessed lighting, it needs to be executed by professionals with years of experience. Subpanels function as an extension for multiple branch circuits going to another area or building. The subpanel is usually placed far away from the main panel in a place the main circuit does not run. This could be in your garage, outbuildings, or an addition you have been planning to construct. Are you unhappy with the current lighting in your home? If you’re looking to install new lighting in your home, call the professionals of Juniper Mountain Electric. Our team will evaluate your current lighting situation and offer advice on the best course of action. Plus we can install all your new lighting options while providing a very affordable rate. Is an outlet in your home not working correctly? Do you have light bulbs you have to replace way too often? Take advantage of Juniper Mountain Electric Service Inspections and keep your electrical system safe and efficient. Our team has years of experience in the electrical industry and will be able to find the source of the issue in no time! Remember, regular maintenance can prevent future problems, and help to save you money in the long run. During a kitchen and/or bathroom remodel, you often need new electrical services completed. The most common additions are for new outlets or lighting fixtures. Experience a total peace of mind during your next kitchen and/or bathroom remodel by choosing someone you can trust to get the job done. Juniper Mountain Electric has experience with various types of outlets, including 220 outlets. 220 outlets are used for larger appliances which require more voltage than regular appliances. If you don’t have a 220 outlet in your home, you may have already experienced some problems with your electrical system. To avoid these common electrical issues in the future, call Juniper Mountain Electric or schedule an appointment for your free estimate. Have you dreamed of owning a professional home theatre, but electrical wiring has prevented you from your dream? Don’t let your dream die. Hire Juniper Mountain Electric for all your installation and rewiring needs. You won’t have to deal with any technical issues or faulty equipment, leaving you to enjoy your new home theatre for many years to come. Are you environmentally conscious? Are you looking for environmentally friendly installations? Juniper Mountain Electric has GPRO installers, so you can rest assured your installation will be environmentally friendly. Your range and dryer need an outlet that provides more voltage. If you’re unsure what type of outlet your appliance needs, or if you wish to have some heavy duty outlets installed, call our experts for an evaluation and/or installation.